Willard was the oldest son of Huston Hackleman. Born in 1907, his mother Elizabeth “Bessie” (Miller) Hackleman died soon after his birth. 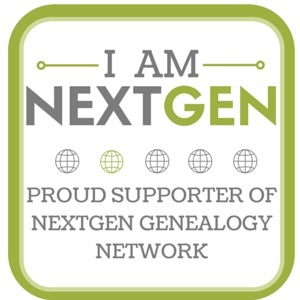 This entry was posted in Genealogy, Lena's Postcards and tagged 1910, Appleton, Connersville, Elizabeth "Bessie" (Miller) Hackleman, Indiana, John Wesley Hackleman, postcard, Willard Hackleman, William Huston Hackleman, Wisconsin on April 2, 2015 by Deborah Sweeney. Appleton, Wis. June 12 1909 10 A.M.
Dear Folks: – We are expecting Grandma Miller today. J. Jr. wants an automobile (big one), bicycle, and a box of chocolates. I wonder if she’ll bring all of them. Huston’s first wife was Elizabeth Irene “Bessie” Miller. They were married on 25 April 1906 in her hometown of McGregor, Clayton County, Iowa. 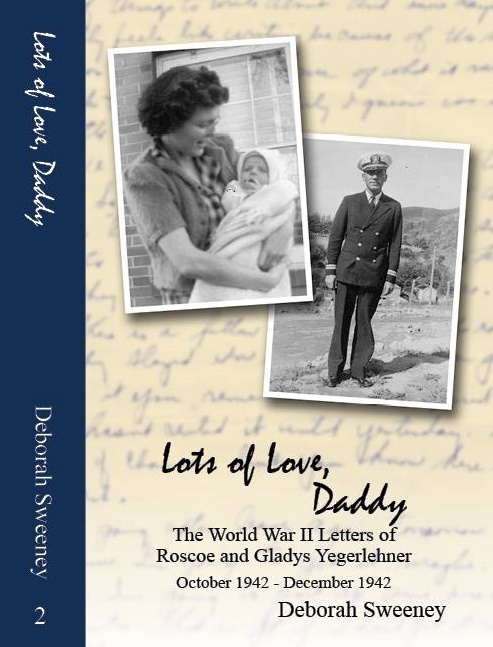 They had one son, Willard Wesley Hackleman, who was born in the spring of 1907. Six months later, in October, Bessie died suddenly while they were visiting family in Iowa. John Carl Hackleman, Huston’s brother, lived with the family in Appleton for many years. In Huston’s postcard, J. Jr. could possibly be his son, Willard, or his brother, John Carl! 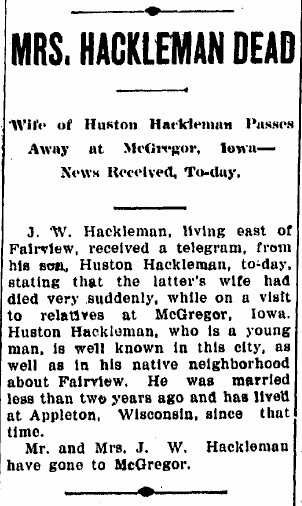 J. W. Hackleman, living east of Fairview, received a telegram, from his son, Huston Hackleman, to-day, stating that the latter’s wife had died very suddenly, while on a visit to relatives at McGregor, Iowa. Huston Hackleman, who is a young man, is well known in this city, as well as in his native neighborhood about Fairview. He was married less than two years ago and has lived at Appleton, Wisconsin since that time. Mr. and Mrs. J. W. Hackleman have gone to McGregor. “Mrs. Hackleman Dead,” Connersville Evening News (Connersville, Indiana), 2 October 1907, p. 1, col. 3; digital image, Newspaper Archive (http://www.newspaperarchive.com : accessed 11 March 2015). This entry was posted in Genealogy, Lena's Postcards, Newspaper Clippings and tagged Appleton, Clayton County, Elizabeth "Bessie" (Miller) Hackleman, Fairview, Fayette County, genealogy, Indiana, Iowa, John Carl Hackleman, John Wesley Hackleman, Lena (Scofield) Hackleman, McGregor, Nannie (Stafford) Miller, postcard, Willard W. Hackleman, William Huston Hackleman, Wisconsin on March 13, 2015 by Deborah Sweeney.